This weekend I raced my first every British Enduro Champs and first ever race in the Masters category! Being my third time to race in Innerleithin and Glentress, I knew that I was in for a week of awesome riding as the trails over there are just top class. After spending the previous weekend up in Fort William for the UCI Downhill World Cup, I arrived in Innerleithen on Monday afternoon. Set up camp at the Rosetta campsite, my usual, and got straight out on my bike to sample some of the fine trails Innerleithen has to offer. I spent the whole day on Tuesday riding between Inners and Golfie, meeting up with my race buddy and absolute legend, Rosalyn Newman for an evening spin. The weather was amazing all week so the trails were dusty and FAAAAST! Taking a break to rest up on Wednesday and Thursday, I was fresh for the first day of practice on the Friday. 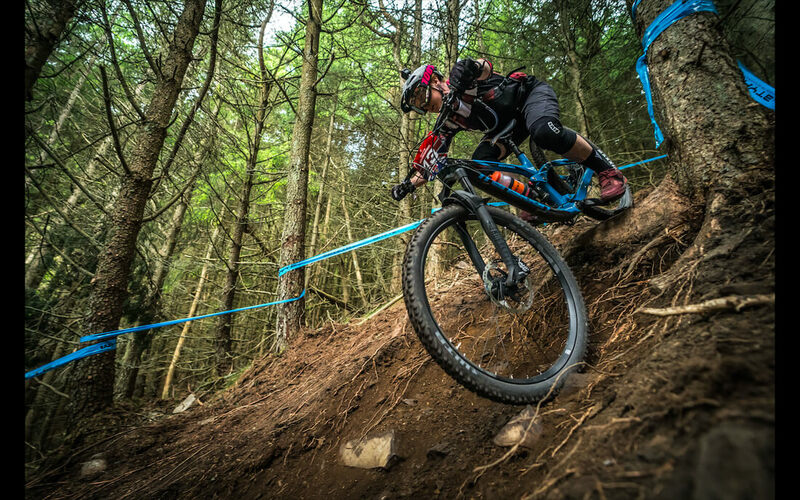 I hit stages at ‘Golfie’ with pro rider Becky Cooke who races for the Orbea Factory Team. It was fun trying to learn the stages while trying my best to keep up with her! Saturday we practiced the stages at Innerleithin and Glentress, home in time to make dinner in the van and get to the rider briefing back at the race village. After two days of really fun, chilled practice, it was time to get racing. I was feeling really good, practice had gone well, my nutrition and sleep was spot on and the weather was ace! The perfect remedy for the perfect race! The women set off from the race village just before 10am. With over 25 women racing, it was really cool that we each set off individually on the stage, each of us having a young local rider to roll down the ramp with. The whole event was organised so well. The transitions to each stage were tight, so there was no time for delaying or chit chatting. We set a good pace along the route to Innerleithin for Stage 1. It was to be my first race on the new bike, and with a weeks riding under my belt, I now felt really comfortable on my new Transition Carbon Sentinel 29er. A big change from last years 650b Patrol with the bigger wheels but I felt good on it within just a few days. Six stages, all very much like downhill stages and pedalling over 53km, it was going to be a six hour day on the bike. The sun was beating down on us all day which made the transitions that bit tougher. I didnt ride as well as I could have on stage one, with a little too much pressure in my back tyre, I felt a little out of control on the steep rooty sections. Stage 2 was a lot better and by the time I got to Stage 3, I was feeling my flow. Stage 4 was the steepest of all, nicknamed F.E.A.R, mainly because thats what it instilled in most of us!! I went for it and rode clean and loved every second of it! Stage 5, nicknamed ‘Awkward little f*#ker’ was just that! It was physical and demanded every ounce of upper body strength as well as skill. Finally, we had the long pedal over to Glentress to the last stage of the day. The fatigue was really setting in at this point but with such a fab stage to finish off on, I couldn’t but be excited about it and forgot about the suffering! I had the best stage of the day on this, winning it by just a split second! I finished in a time of 23.10, placing 3rd in Masters. Massive congrats to Rosalyn Newman who was crowned Masters British Champ and to Fiona Beattie in 2nd. These girls know how to shred! Massive thanks to TWEEDLOVE for an amazing event! These guys nailed it!